Steve has a background as an Illustrator in Advertising and Publishing, working for clients which include Mitsubishi, Nestle, IBM and Coca Cola. He began his freelance career in Adelaide in 1981 and travelled to the United States and Canada where he was tutored in conceptual art and technique, which has greatly inﬂuenced his work. He was subsequently invited to exhibit in a combined show in New York City at the Master Eagle Gallery. Since moving with his family to Sydney in 1984 Steve has continued to exhibit in Melbourne and Sydney with his work being popular with overseas buyers from United States, UK, Singapore, Hong Kong and South Africa. His work was selected for a touring exhibition, "Artists from Australia", which travelled to New York, San Francisco and Melbourne. 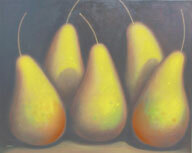 He works in oil and acrylic on canvas, painting figurative beach scenes and textural still life. The artwork of Steve Graham has been reproduced in Limited Edition Prints, Calendars, Posters and Book Covers as well as the prestigious Swiss Publication "Graphis". His artwork currently is being exhibited at Christopher Day Gallery Paddington, South Yarra Art House Melbourne, Moulton Galleries Mosman, Gold Coast and Mona Vale.